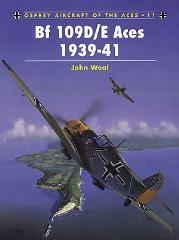 The period covered in this volume was considered to be the 'glory years' for the Jagdwaffe - fresh from the experience gained in the Spanish Civil War - and for the Bf 109 in particular. Many famous pilots scored their first kills in the classic dogfights staged over Poland, Western Europe, the Channel and finally southern England. Some 40 Knight's Crosses were awarded in 1940 alone. However, after sweeping all before them in support of the Blitzkrieg across continental Europe, the Bf 109E pilots were to suffer badly during the Battle of Britain, the result of poor tactics inflicted upon them by the Luftwaffe High Command, and their mount's less then generous range.